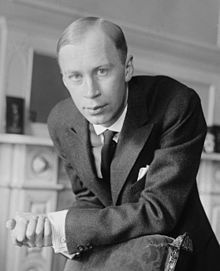 Sergei Sergeyevich Prokofiev (Roushie: Сергей Сергеевич Прокофьев;[n 1] 23 Aprile 1891 – 5 Mairch 1953) wis a Roushie an Soviet componer, pianist an conductor. As the creator o acknawledged masterpieces athort numerous muisical genres, he is regairdit as ane o the major componers o the 20t century. His wirks include such widely heard wirks as the Mairch frae The Love for Three Oranges, the suite Lieutenant Kijé, the ballet Romeo an Juliet – frae which "Dance o the Knichts" is taken – an Peter an the Wouf. O the established forms an genres in which he wirked, he creatit – excludin juvenilia – seiven completit operas, seiven symphonies, aicht ballets, five piano concertos, twa violin concertos, a cello concerto, a Symphony-Concerto for cello an orchestra, an nine completit piano sonatas. ↑ Roushie pronunciation: [sʲɪˈrɡʲej sʲɪˈrɡʲeɪvʲɪtɕ prɐˈkofʲjɪf]; alternative transleeterations o his name include Sergey or Serge, an Prokofief, Prokofieff, or Prokofyev.